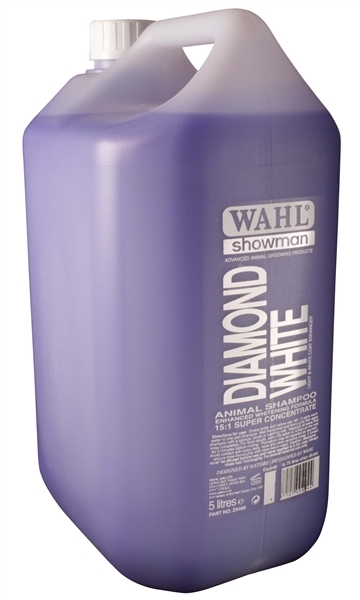 Wahl Diamond White Shampoo is based on natural ingredients and contains no harmful detergents or cleansers.The perfectly balanced formula including extracts of cucumber, passion flower, lemon and lime, achieves exceptional results on white and light coats, effectively removing dirt, grease and stains. White enhancers revitalise and refresh the natural white and light pigmentation within the hair, leaving the coat bright, silky and vibrant, shining with vitality and health. Formulated for all animal hair types including horses, dogs, cattle, goats, llama, alpaca, rabbits and ferrets, Diamond White rinses out easily, leaving a soft, manageable, ultra white coat.